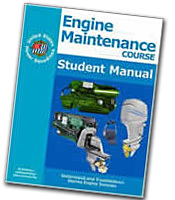 The new Engine Maintenance course 2011 has been put into one ten chapter course that stresses the diagnosis of modern systems, while also teaching the basics of engine layout and operation. Gasoline inboards, outboards, and diesel engines are taught in a way that reinforces the common aspects of how engines work. This new course is complete in one book with one exam. Modern engines offer high reliability and good performance through the use of computerized systems for fuel delivery and engine timing. Most of these systems are “black boxes” that can no longer be serviced by weekend mechanics with ordinary tools. The EM course covers those repairs that do-it-yourselfers can still perform, teaches how to diagnose problems that might be beyond your ability to fix, and how to share information with your mechanic so the right repairs get performed. The new Engine Maintenance course also covers basic mechanical systems such as drive systems (propellers), steering systems, and engine controls. The last chapter discusses solutions you might use to problems that could occur while afloat and away from a repair facility. Gasoline, diesel, and outboard engines are treated independently in this chapter.